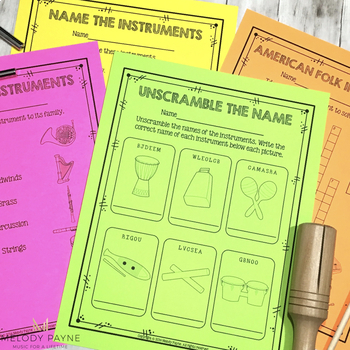 Need a quick way to assess your students' understanding or memory of musical instruments? 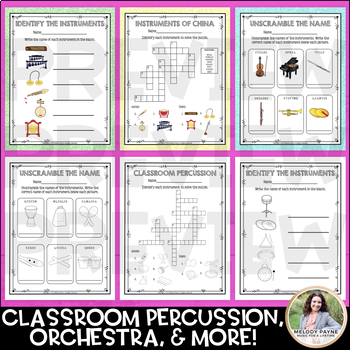 These musical instrument worksheets, quizzes, assessment, and crossword puzzles are just the thing you've been looking for! 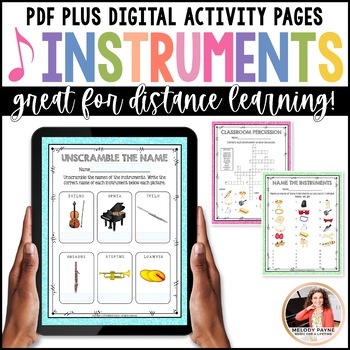 Perfect to use as a quick quiz, homework, review, in the sub tub, during a musical instrument unit, and more! And when students finish the quiz, they can color the instruments. View the PREVIEW for a quick peek at some of the worksheets that are included. Purchasing this item grants you a SINGLE USER LICENSE for use by a single teacher. Purchase multiple licenses for multiple users at checkout. Not for commercial use. Copyright © 2014 Melody Payne. All rights reserved. Click here for more music worksheets!